Automatic Gate Masters LLC. is your best choice for beautiful and affordable ornamental and wrought iron gates for Los Gatos residential and commercial properties. Automatic Gate Repair Los Gatos, Expert And Local! 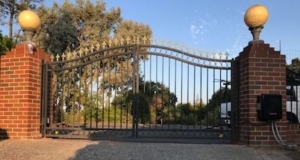 Automatic gate repair Los Gatos - It’s not unusual to see automatic gates in the driveways of mansions, large estates or ranches. You may not expect to find out, however, that this amenity raise your house's value too. Automatic gates installation Los Gatos are available now for homes of all sizes and price ranges. One reason for this growing trend is that attractive and convenient. affordable automatic driveway gates openers are available at Automatic Gate Masters. 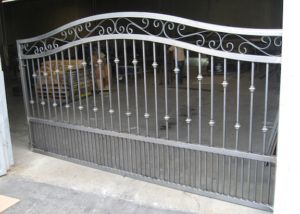 Experts will take care of the high quality gates installation in Los Gatos. Electric gate openers and optional accessories such as keypad can be matched with the gate. To ensure smooth operation and longer lifetime we need to maintain it. In this guide, we’ll give you a rundown of everything you need to know about adding a driveway gate to your home. There are three main benefits to having a driveway gate with an opener. - curb appeal and increased property value. Security: A driveway gate prevents unauthorized vehicles from entering the property. It can also help protect children and pets, especially if the gate borders a perimeter fence. Curb Appeal: Modern driveway gates are elegant and manufactured to be an asset to your property. When properly installed, a gate has a stately presence that instantly improves the look of any home. If you currently have a driveway gate, you can automate it by installing an automatic opener. Property Value: By enhancing the security, a gate can potentially increase the property value. Before discussing the finer details of driveway gates and automatic openers. let’s take a quick look at the major components of a typical system and how it operates. The gates are securely mounted to posts that are in concrete and buried deep into the ground. Gates can also be mounted to brick pillars or stone columns. The automatic opener welded to the gate and post. Then it's connected to either a buried 120-volt electrical cable or solar panel. Power flows from the cable or solar panel to a rechargeable battery. Press the button on the gate opener remote, as a result the battery powers the motor to open the gate. You can also install a keypad, which allows anyone to open the gate by entering a four-digit code. Some systems permit operation of the gate via an electronic swipe card, vehicle tag or mobile phone app. Start with gate material and design, then move on to size, opening action and accessories. A. Material: Most driveway gates are made of powder-coated steel, wrought iron or aluminum. Steel and iron are strong and durable, but aluminum is lighter, rust-resistant and less expensive. Wood gates are available as well, but note that they’re heavy and prone to cracking and warping. Plus, wood gates require more maintenance than metal gates. B. Design: Gates come in various designs depending on the gate crafter. Most residential driveway gates have a series of vertical pickets set within a perimeter frame. The three most common gate designs include: flat-top, arched-top and arched-top with finials. .most popular style for driveway gates. Arched-Top: The upper rail of a standard arched-top gate is bent to form a gentle upsweeping arch. The pickets fit flush within the rail. This is the most popular style for driveway gates. Arched-Top with Finials: The arched-top gate with finials is similar to the standard arched-top gate, except that the tops of the pickets extend past the upper rail. Each upper rail is fitted ith a decorative finial. Note the slight variations in these three basic designs. For example, there are gates with double upper rails or spear-point pickets set within the frame, and some flat-top gates have pickets that protrude past the upper rail. Another option is to have a steel gate custom-designed and built by a local metal fabricator. One more is to hire a carpenter to custom-build a wooden gate. These are the most expensive options, but they allow you to create a truly unique driveway gate. C. Size: After choosing a gate design, you must decide on the proper size gate for your specific driveway. Ready-to-install driveway gates measure 4 ft. to 6 ft. tall, and come in various lengths to accommodate virtually any driveway width. 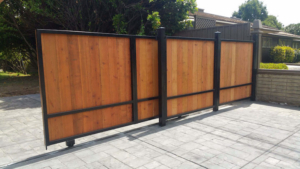 A single gate is commonly available in 12 ft. lengths and is sufficient for narrower driveways and tight spaces. Dual gates come in 12 ft., 14 ft. and 16 ft. lengths and provide a larger traffic lane. They are recommended for wider driveways. When deciding on which size gate to buy, be sure it opens wide enough. As a result ambulances, fire trucks and other emergency vehicles will be able to pass. D. Opening Action: There are two ways that driveway gates operate: either by swinging or sliding. A vast majority of residential driveway gates swing open because they require less space beside the driveway than a sliding gate. Most driveway gates swing inward, meaning as you pull into the driveway, the gates swing inside toward the house. However, whether or not you can install an in-swinging gate will depend on the slope of your driveway. If the driveway is relatively level or slopes down toward the house, then you can install an in-swinging gate. However, if the driveway slopes up toward the house, there might not be enough clearance to swing inward. (There is typically about 4 in. of space beneath the gate.) In those cases, the gate will have to swing away from the house and toward the road. Remember to consider the gate’s position on the driveway. It’s important the gate be far enough up the driveway so that vehicles, including delivery trucks, can pull up to the gate without blocking the road, sidewalk, bike lane or pedestrian crosswalk. We Provide Automatic Gate Repair Los Gatos. 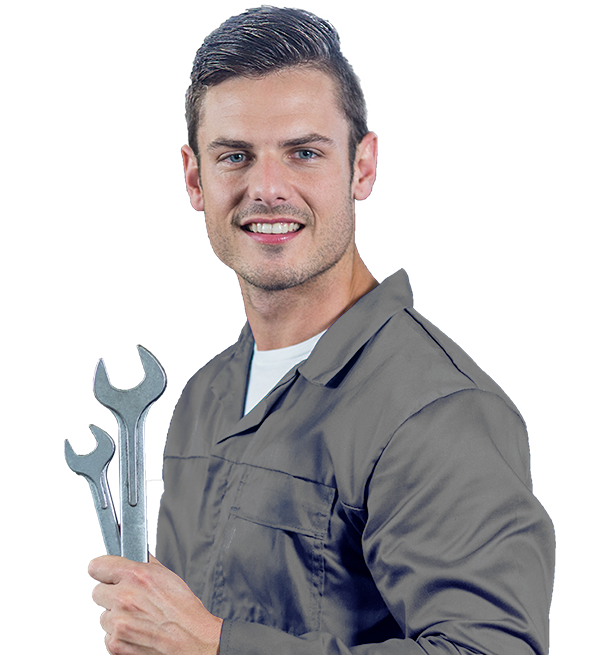 best prices for automated/motorized gate repair services. We got the latest gate operators and access control systems. Our rates are competitive; Provides excellent warranties! When it comes to communicating with guests at your gate, get the job done than using our high-quality telephone intercom systems. Offers residential and commercial clients the best value in automatic gate installation. To help our clients get the automated gate they are envisioning, we offer free consultations and honest, expert advice. Because nearly everyone on our team has decades of hands-on experience and training, you can trust that we have the industry knowledge and artistic ability to ensure your new gate will be exactly what you want and more. Automating your gates is a sensible option for homeowners who expect to use them regularly. It’s undoubtedly more convenient, and arguably improves security. But automation also means a complex installation with a greater chance of failure and, added cost. Gate Masters dealing with automatic gate repair Los Gatos on daily basis. Dual Swing gate openers are obviously designed for a pair of gates. If you want a pair of gates to swing open, you’ll need two openers, which adds another motor to costs. Swinging gates, however, will not be much of an option on sloping driveways. Sliding gate motors demand at least the same opening to the side as the gate itself. Now for the mechanics. The most common option is for a Liftmaster swing arm operator. A bit like an automated version of the arms you get on self-closing doors in office buildings. which operates off an electrical powered to the side of the gate itself. The arm itself will be visible off the top or bottom of the gate itself. Hidden gate openers or in-ground systems improve aesthetics but are more complicated to fit. More expensive though and, if not installed correctly, are open to issues with water ingress. With sliding track systems, the benefits and potential problems which can lead to automatic gate repair Los Gatos. Our reputation is great and we our customers always happy with an excellent customer service and great Gate Products. 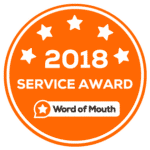 "Quick convenient service, Polite Staff, Couldn't Be Happier." "Fast and friendly High quality automatic gate openers!"